Vishal Bharadwaj gets loose and has some fun at the expense of a formulaic story and then gives the whole thing a wicked twist. It is a mix of greedy gangsters, twin brothers ( " हम दोनों जुदवे है..." ( "We are both twins") is said in a very tongue and cheek manner), and a guitar that binds them all... to the climax. The performances are endearing and gritty. Shahid Kapoor leads the pack with his portrayal of the timid stammerer Guddu and the notorious race course bookie Charlie. Priyanka Chopra oozes charm and sensuality especially in her scenes with Shahid. Taare Zameen Par creative director Amol Gupte is a revelation in his acting debut. The 'smoke, bullet and fire' culmination is apt, garnished with some Hindi film 'reality compromise'. 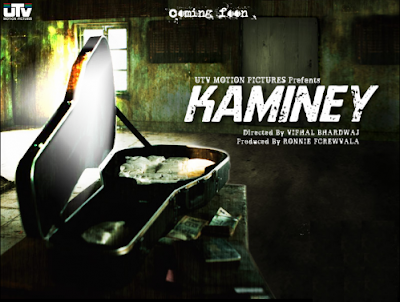 Surely, some creative liberty is allowed, for Kaminey is no wannabe serious cinema. It aims to entertain and does that with style. The core, the depth may seem to be missing for the cinema lover...but go for it!